"The Syndicate which is putting up the money asks me to use Captain Kendricks maps for guidance"
Since 1894, when Earle started the first 'Lost Gold Reef in the Outback' fraud, unreliable maps have been the main excuse for not finding a glittering bonanza in Central Australia. A little over five weeks before the First C.A.G.E. 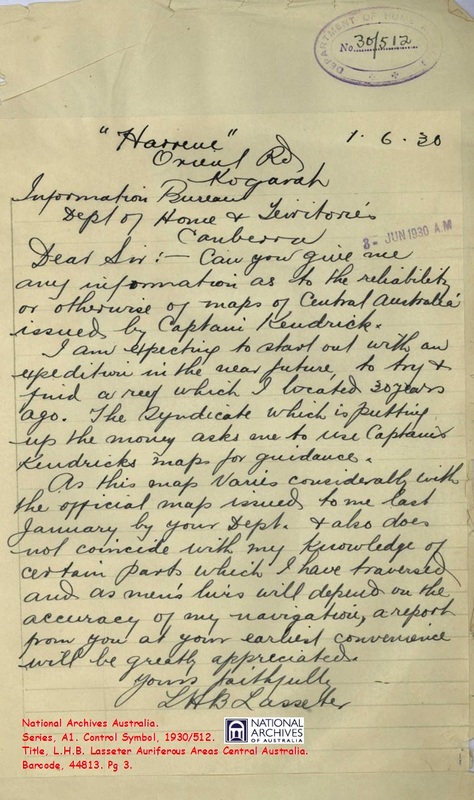 Expedition left Sydney, Harold Lasseter wrote to the Department of Home Affairs requesting comment on the accuracy of the maps of Central Australia acquired from a Captain Kendrick. In the letter Lasseter infers that the Syndicate (C.A.G.E.) preferred to use Kendrick's maps of the area rather than maps issued by the Government. Home Affairs replied within the week and Lasseter may have been pleased with what he read, the Department had no knowledge of Captain Kendrick or his maps and rather pointedly added that, "no person of the name mentioned has any official authority to issue maps of the whole or any portion of Central Australia." C.A.G.E. would now have to rely on the 'Official' maps and Lasseter's, "knowledge of certain parts which I have traversed". So who was Captain Kendrick? As written by Lasseter there are two that fit the title and name, the first was the Master of the Inverlochy that ran aground 20 miles west of Barwon Heads in December 1902, all hands were saved including an able seaman Lassiter! The second was a British, Passport Control Officer, who happened to be 'touring' Austria in 1938, he was arrested by the Gestapo and released after the usual diplomatic trade offs. Neither man can be connected to the mapmaker favoured by C.A.G.E. On the other hand, allowing for a misspelling on Lasseter's part, and Lasseter had an odd habit of misspelling proper nouns, then there is a Captain Kenrick who is possibly the mapmaker Lasseter refers too. A. J. Kenrick was a South African scientist and engineer and a Captain in the Royal Naval Reserve, according to Kenrick; who emphasised his title and expertise at every opportunity. Apparently Kenrick was actively prospecting in New Guinea from the early 1920s and there is no obvious record of time spent in Australia prior to 1930, although in 1933 he did comment on the potential of the West Australian goldfields. Brief press reports over 25 years show no fortunes coming Kenricks way, he allegedly mapped and prospected parts of New Guinea and his greatest reward seems to have been £2000 cash as vendor in the sale of his company to Moroka Dredging and Exploration Co. By the mid 1930s Kenrick had retreated to Australia where he occasionally prospected the northern parts for anything valuable, but seems to have spent a great deal of time promoting mining companies and himself. He had unusual opinions for the time, he was certain that no oil would be found in Australia or New Guinea but perhaps in New Zealand; and the former German New Guinea should be returned to Germany, as a bulwark against the rising union of China and Japan. Kenrick was last heard of in 1954, promoting the Atomic Rare Metals and Oil Syndicate, who were prospecting parts unknown for, "copper, tin, cinnabar, cobalt, plutonium, uranium and other minerals", the syndicate also had a permit to prospect for oil! In his letter, Lasseter states that he found his reef in 1900, as history records the Lasseter Legend this is the year that he and surveyor Harding rediscovered the Reef and miscalculated its location because of faulty watches. Lasseter also reminds the reader that he has previously travelled the country mentioned and therefore can claim some expertise on the matter, a common theme through Lasseter' correspondence at this time. National Archives Australia. Series, A1. Control Symbol, 1930/512. Title, L. H. B. Lasseter Auriferous Areas Central Australia. Barcode, 44813. Pgs, 1,3.